A delightful combination of two classics, the Amish Fifth Avenue Executive Corner Roll Top Desk takes a corner executive desk and pairs it with a beautiful roll top desk for a winning combination. 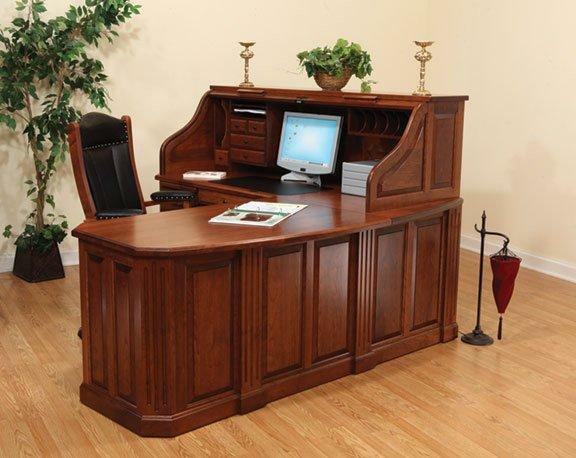 For a greeting or reception area, a corner office or the center of a home office or business space, this solid wood desk is an attraction full of fine features and maximum function. An executive desk like the Fifth Avenue takes center stage easily, and the raised panels, fluted accents and dentil moulding contribute to the star quality of this wood desk. Adding the roll-top desk ensures a place for everything, with a full array of compartments and organizational features that keep everything you need for your busy day right at your fingertips.